Safety First Rotary Trimmers are the preferred option for graphic designers, repro houses and photographers as they give a burr-free cut. The rotary blade is housed in a plastic cover, thus ensuring absolute safety. The rotary blade is also self-sharpening due to its cutting action against the lower blade. This model makes it easy to cut paper, photographs and films accurately and precisely, with a ground circular blade that cuts in either direction. 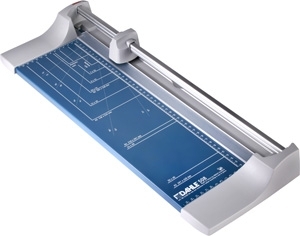 DAHLE Personal Trimmers are the first choice of scrapbookers. Have two if these for 4 years and still working well.